We mentioned on twitter that Yu Darvish will have his turn in the rotation skipped to work on his form in Nippon Ham’s ni-gun practice facility, so in this post I will address how the ni-gun is structured in Japanese baseball. In the NPB, there is no Triple-A, Double-A, or Single-A; there is the ni-gun, meaning “second troop”. The top level, major league-equivalent teams are known as ichi-gun or “first troop”. With both leagues operating with an odd number of teams, the team with no game scheduled often plays against amateur industrial league teams belonging to the JABA (Japanese Amateur Baseball Association). Although the existence of these ni-gun teams are similar to minor leagues from a player development standpoint, the business behind the operations of these teams is completely different from the world of US minor league baseball. Even though Minor League Baseball teams here in the States are affiliated with a MLB team they operate business as independent organizations. Minor League ball clubs has their own websites, stadiums, and in most cases their hometowns. However, the ni-gun differs in many ways compared to the operations of a minor league team as they usually do not operate independently and are run as more of a practice and development facility for the NPB teams. The only team name differing from its affiliated ball club is the Shonan Shirex and they don’t even have their own website. A scene of announcing the starting lineup at the ballpark can be seen here and it is quite a bit different from an atmosphere you may be able to experience at a minor league game. Even though the Nippon Ham Fighters’ ni-gun team, playing at Kamagaya Stadium, is attempting to operate like a minor league ball club with promotions and events in a “Minor League” style, those types of ni-gun teams are still rare. With only twelve teams at the professional level in NPB, there are few opportunities for players to make a living by just playing baseball. Teams are making efforts to provide playing time for young players like the Chiba Lotte Marines and the Yomiuri Giants working together forming a new team called Sirius for ikusei players and younger players to get game experience. However, with teams being limited in their roster spots and the future looking certain that there will not be a new team joining NPB anytime soon, independent leagues and ni-gun teams operating independently is one possible area of growth for professional baseball in Japan. If the number of professional teams increases in Japan outside of NPB, more players will have the opportunity to play at a higher level and the game will grow popularity around the country. Will the new development of independent leagues impact the state of professional baseball in Japan, and will ni-gun baseball begin evolving into a business of its own? C. J. Nitkowski on Ni-Gun (Japanese). If you play with the URL, you might find an English version. When the Searex were created, they even created like 12 mascots for the team, one for each position on the field and a couple for coaches. Just crazy. Sadly, you can’t find a picture of them anymore, excluding Rex who was the pitcher and now primary mascot. Hey Ryo, have you ever actually been to a ni-gun game? I’m just curious. The SeaRex have actually been notable over the last few years for trying to build their own image and game style, and do a true minorleague promotion style much moreso than the Fighters ni-gun does, actually. Heck, I was just AT a SeaRex ni-gun game tonight in Sagamihara and was reminded again at how much they’re better at it than us, especially in that they usually play night games during the week, which is different from every other ni-gun team, where 95% of their games take place at 1pm, give or take an hour. The SeaRex ouendan even has drums and trumpets — at its best on weekends, in Kamagaya, we get a bunch of people with tambourines and flutes. Kamagaya certainly has its own personality just due to the location, but the Tokyo Dome home game events are pretty much done by the same people who do the Kamagaya events, so it’s more a matter of just being Kanto vs. Hokkaido, rather than being a separate entity from the main team. BTW, Darvish hasn’t actually been working out with the ni-gun squad, he’s still with the ichi-gun folks and is just off the active roster for a bit. 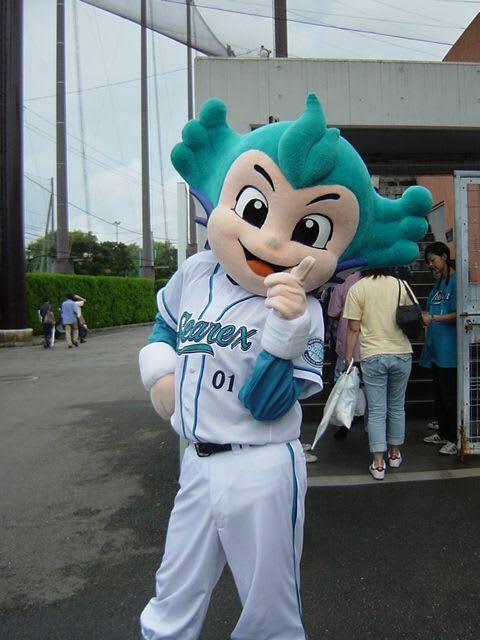 I asked about it tonight, as pretty much nobody has actually SEEN him in Kamagaya. He’ll supposedly be down there this weekend, but who knows. I wrote a longer report explaining the ni-gun teams several months ago. At the time, the Orix ni-gun team was still called Surpass, though that’s changed. Two years ago, Seibu’s ni-gun team was called Goodwill. It mostly depends on sponsorship more than anything. Another thing that the odd-man-out ni-gun teams tend to do in their days without official league matches is either do the Futures games if they’re in the Eastern League, or play exhibition matches against the Shikoku-Kyushu League or the Hokushinetsu League if they’re in the Western League. This week they’re even combining the two; the Shikoku league sent up a representative team to play against the Eastern League Futures today and tomorrow… and in the first game the Shikoku-Kyushu players CRUSHED the Futures team 14-5. I’m not sure any other ni-gun teams have their own mascots besides the Fighters’ Cubby and the SeaRex’s Reck, actually. I don’t think anyone here approaches your ni-gun experience Deanna. I was looking for the overview you wrote of it last winter, but simply searching your site for “ni-gun” produced more results than I had time to dig through. Also, now that I think of it, Seibu’s ni-gun team was called Invoice for a year or two, and Orix’s used to be called Surpass. Thanks for the note Deanna, I read the report that Darvish was going to train with the ni-gun squad, so I figured he was in Kamagaya. The only ni-gun facility I have been to is Naruohama (Hanshin Tigers), so I am sure you can report from experience more than myself. When Yokohama rebuilt Nissan Oppama Kyujyo into Yokosuka Stadium and renamed the farm team to SeaRex, it was with the intent of make the farm team a self-sustaining entity. I talked with Sasaki-shacho during the SeaRex FanFest last year and asked how that was going. He said, “It’s been difficult.” They’d managed to get a couple of major sponsorships, but not enough to really run the club independently. Through the conversation, it sounded like they made an effort, but after so many years have finally conceded defeat to the prospect. You can still see all of the characters on various Keikyu busses that run in the Oppama and Kanazawa-ku areas. I’ve never been to a US minor league or ni-gun game, but it seems like US minor league model works because teams are mostly in rural markets far away from major league baseball, or, more recently, the suburban areas of the parent teams (the Mariners affiliate in Tacoma or Everett, Deanna help me out; the many Red Sox affiliates in New England; the Yankees’ AAA team in Scranton). I dunno anymore, but when I lived in Seattle, the Short A affiliate was in Everett (the Aquasox) and the AAA was in Tacoma (Rainiers). I think they both benefitted from being near the parent team… but were still far enough away that they got more of a local crowd there than anything. One thing is also that in Japan, the teams make trips to various rural areas and play games there, so there are very few places in Japan that won’t get an ichi-gun game near them at SOME point in the year… it’s just not that big a country. Darvish has finally made an appearance in Kamagaya and started practicing in the ni-gun facility.